Great to be back up here; thanks to Charlie for running things and reporting last week, you’ve got me now on the blog for a couple of weeks. The weather is better than forecast, no snow and perfect spring weather, touch of chill in the wind, but benign – at the moment! I do enjoy the reunions at the airport hotel on the way up here. Many friends, re-united for an annual week in wilderness salmon fishing heaven. Lots of banter, stories and tall tales and real anticipation of another great week here. Despite a late night – for some – everyone was up and ready to go. We had a pretty smooth journey up here today, and were through Murmansk airport surprisingly quickly. We were all in camp in time to un-pack and have a well deserved drink before dinner. The Middle Camp team this week are keen, very keen, we all know that; Big Misha ran a boat down here late this evening to pick up some kit. ‘Crazy fishers’ he said ‘no eat, only fishing’. I’ll get the full report tomorrow but I gather they had quite a haul this evening. (Such a pity this beat was not fished last week). I flew over to Kitza to drop the team off there. It looked in good order, certainly not ‘high’ by the standards of the two last cold springs, and it looked about perfect for this time of year. Tom said the water temp was 7°C, he had had quite a few fish over the past few days. I’ll keep you posted on results. Here at Lower Camp the team, hosted by Michael Evans, had a slightly more sybaritic approach to their arrival and enjoyed one of Jenna’s wonderful dinners. After four excellent courses I did remind them that the air temperature was falling fast and if any one did want to fish this evening it had better be soon. 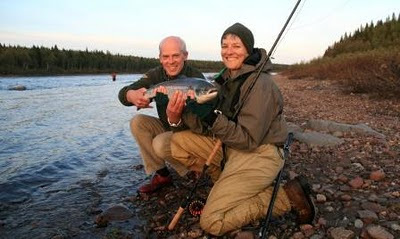 Very quickly Daryl E had one and lost two and Joan G got her Varzuga salmon before the air temperature really switched the river off at about 23.00. I will post a full report on conditions tomorrow – in a nut shell, the water temp is up to 11°C but the weather is definitely cooler now. Water height is still pretty good, about what I would expect for this week.